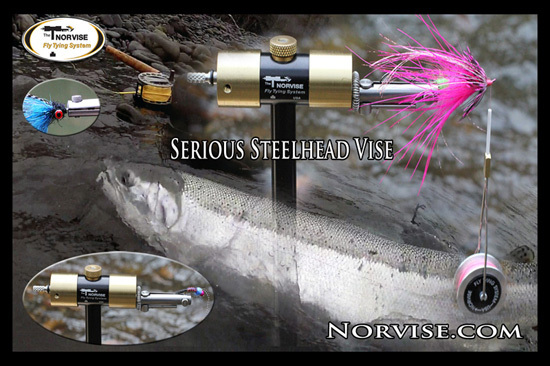 Unbeatable Fly Tying Vises by Norvise - This is the vise that Grabflies uses to tie it's flies. As experienced fly tiers know, the revolutionary rotary fly tying vise by Norvise has advantages over other rotary vises. Combined, these advantages make the Norvise a tool of both art and science — yielding a lifetime of fly tying success. Norvise positions the hook on a perfect rotational centerline, allowing the hook be spun, replacing tiresome hand-over-hand wrapping. With the shank of the hook always aligned to center, the material is “turned” or “spun” onto the hook. This is a real labor and frustration saver. Precision ball bearing and heavy brass hubs enable Norvise to work like a spinning wheel for the world’s most fluid dubbing, creating perfectly shaped and textured bodies. Working thread, other body materials and hackle are applied better, faster and easier than by any other method. The Norvise system accommodates several configurations, or “conversions” — all quickly and easily mounted onto the vise arbor. These configurations will handle nearly any fly tying situation — from tiny, delicate trout flies to large saltwater patterns — each different “configuration” excels in certain applications.